comprehensive understanding of the candidates in various undergraduate subjects in Engineering/Technology/Architecture and post-graduate level subjects in Science. GATE 2018 will be conducted for 23 subjects (also referred to as “papers”) and it would be distributed over 3rd, 4th, 10th & 11th of February 2018. The GATE examination centres are spread in different cities across India, as well as, at six cities abroad. It would purely be a Computer Based Test (CBT). particular subject, which is quantified based on the several years of examination data. Note that the GATE 2018 score is valid for THREE YEARS from the date of announcement of the results. 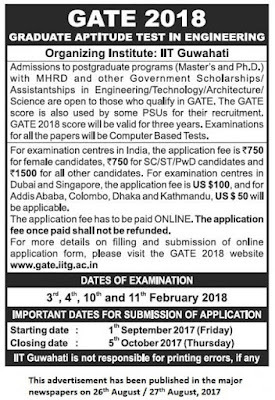 GATE 2018 Exam scores will be valid for 3 years from the date of issue of the certificate. 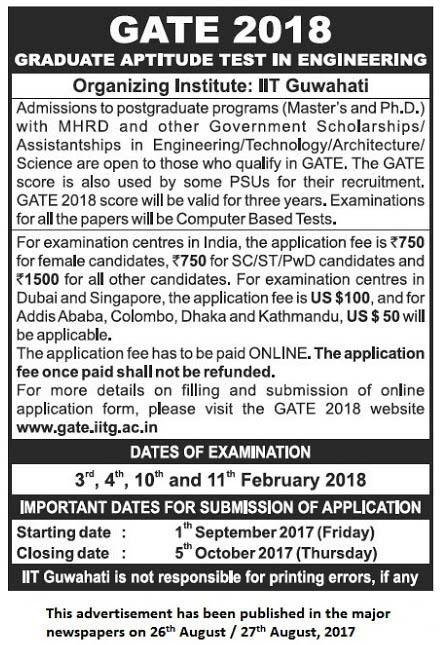 GATE exam valid score is essential entry key, to get apply Management Trainee / Industrial Trainee / Graduate Trainee / Assistant Manager / Manager Postings in Public Sector Undertaking (PSU) companies in India.